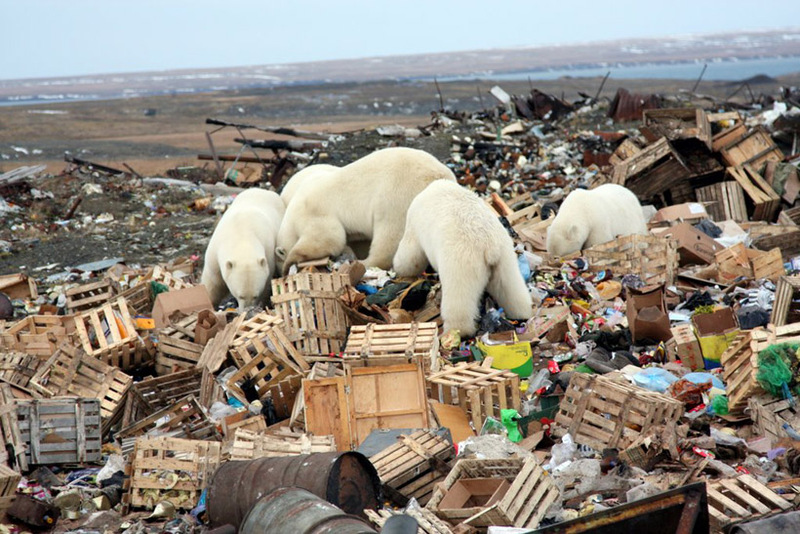 Claim: Rubbish Dump Polar Bears are "Climate Refugees" | Watts Up With That? Claim: Rubbish Dump Polar Bears are "Climate Refugees"
NYT brings us this heartrending story about polar bears on the verge of extinction fooling people into thinking they are fine, by looking overweight, and scavenging Alaskan rubbish dumps. The bears that come here are climate refugees, on land because the sea ice they rely on for hunting seals is receding. KAKTOVIK, Alaska — Come fall, polar bears are everywhere around this Arctic village, dozing on sand spits, roughhousing in the shallows, padding down the beach with cubs in tow and attracting hundreds of tourists who travel long distances to see them. At night, the bears steal into town, making it dangerous to walk outside without a firearm or bear spray. They leave only reluctantly, chased off by the polar bear patrol with firecracker shells and spotlights. On the surface, these bears might not seem like members of a species facing possible extinction. Scientists have counted up to 80 at a time in or near Kaktovik; many look healthy and plump, especially in the early fall, when their presence overlaps with the Inupiat village’s whaling season. But the bears that come here are climate refugees, on land because the sea ice they rely on for hunting seals is receding. Back in the real world, as WUWT reported in 2015 Polar Bears are doing just fine. Predictions of imminent starvation are based on models. Regarding the large numbers of bears around Kaktovik, does anyone think it possible locals whose income depends on “hundreds of tourists” visiting to see the bears might be deliberately leaving some food out? December 18, 2016 in Alarmism, Polarbeargate. Yep, that was the first thing that occurred to me reading about Inuit whale hunting season. It’s like saying that seagulls which scavenge on municipal waste dumps are only coming there as climate refugees and because we’ve eaten all the fish in the oceans where they would normally hunt. Foxes scavenge is towns too, better mark them down as climate refugees too. The reason there are more polar bears in town is also because there are more polar bears. 20,000-25,000 compared to a nadir of only 5000 when hunting was allowed. Maybe a few more hunting permits are in order in these areas. Mind you, the greens would probably rather see human babies taken by polar bears than accept the sight of some viscous hunter killing a poor, fluffy white polar bear. 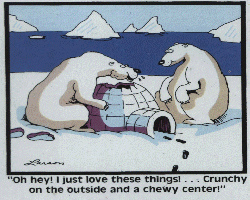 No doubt the polar bears would agree, a nice fresh & tasty morsel instead of raiding the bins for junk food. Hey, who are you callin’ thick?! There have been squid in the North Sea for quite a while. At Hound Point tanker terminal in the Firth of Forth squid are regularly seen and have been since the thing opened in the 1970s, and occasionally octopus are caught at the entrance to Grangemout Docks. I was thinking that if global warming is causing this polar vortex, couldn’t we all apply as climate refugees? During this time of year, I think the UN should take responsibility and relocate me to Hawaii or the Caribbean. Think of all the co2 that wouldn’t be released from trying to keep warm from global warming. … the cold, freezing huddled masses… the horror ! And good ones, at that. Ditto my raccoons and possums! Just repackage this as the bears are recycling..
What I noticed was the childish (and cowardly) manner in which the biologists got the author of this piece to deal with my exposure of their failed hypothesis from 2005 (the one that got polar bears listed as threatened/vulnerable). So, it was not just some random blogger but a legitimate and qualified peer of theirs who has exposed this failure. They won’t even provide me the courtesy of calling me by my name – sound familiar? I believe Steve McIntyre was treated similarly by the climate change establishment. Online readers could (and did) click through to that post but print readers had no idea to whom the writer was referring. Well, but that’s not what they said back in 2008 based on their 2005/2006 data. They predicted a decline of 2/3 of the world’s polar bears (and total extirpation of 10 vulnerable subpopulations, including the Southern Beaufort one that’s the topic of the NYT article) when sea ice reached the lows that they predicted (not even every year, but if it happened 8/10 years). We’ve had that level of sea ice since 2007 – polar bears (especially Southern Beaufort and Chukchi Sea bears) have lived through the 2050 “worst-case” scenario envisioned by these folks for 10 years. In my opinion, this article is primarily a vehicle for the biologists to refute my challenge. Why do I think that? Because I have been trying to get a paper published in the scientific literature – which they have so far been able to block but which has gotten strong support by a few reviewers (just not enough of them). However, I address this issue head-on in my forthcoming book, “Polar Bears: Outstanding Survivors of Climate Change” which will be out shortly. A great, great title for your book. I will check to see if the New York Times has it in their book review section. For some reason I doubt it. 🙂 If they do, how will they answer all the inconvenient questions from their brainwashed subscribers? Your book has been added to my books to read in 2017 list. Dr. Crockford, thanks and please keep up your good work. I look forward to buying and reading your book. I saw the title here and thought of you. Thus, I searched for your name and see you are up early and working. So, I’m going out in cold and snow to feed horses and toss a couple of apples at the local deer — mamma and twins from last spring. Looks like a lot of snow falling in the Cascades of WA. B.C.? But I did wonder about the photo — good light and all? Anyone know what gets shipped in — in the small wood crates? I’d like a few of those. I believe those are Russian bears at a Russian dump. Should have recognized the bears were dump hacking. Just can’t escape those dastardly Russians. Stop shootin’ ’em, the numbers pop up pretty quickly. Allergic to hot lead, someone oughta research that! Thanks Dr Crockford for your insights, looking forward to your book, @ John F, in Washington, yep those crates should be recycled even as firewood. It is a basic survival instinct to live where the living is easiest. No creature in its right mind will desire to live in deprivation. If we make scavenging a more successful strategy than expending energy to hunt, then what do you think will happen? Like the homeless they will gravitate to where the pickings are the easiest. So, if we don’t want homeless people in our city . . .? I would imagine it is quite a risk for a bear to venture out onto the ice and sit over a hole/s waiting for seals. There must be times when weeks go between feedings. it would stand to reason that easy pickins is better than expending so much energy. I use to live in Banff, Alberta and way back in the seventies going out to the dump on a bright summer evening one could witness scores of bears feeding on restaraunt waste. You may scoff, but I’m told there are no more penguins there to be eaten. How would you like to be restricted to a diet of fatty seal meat? Indeed you have so please link your source. Realistically though, just how long have the Polars been coming their to make it a tourist event? Obviously a local extinction of penguins. When I was in in Churchill in 1969, people went out the dump to see the polar bears. Way easier than hunting seals. Penguins? In the northern hemisphere? So I have been told! But then I usually get told a few times a day, every day! Penguins are found as far north as the Galapagos. We have penguins in Pittsburgh! No, I mean actual penguins, at the zoo. Actually yes, but they are extinct. The original penguin was the flightless Great Auk Pinguinus impennis. Penguin is the celtic name for the Great Auk. Incidentally they were probably rarely eaten by polar bear, since they normally bred south of the range of the Polar Bear. However, the great auk wasn’t closely related to penguins, which get their name from the auk but belong to different orders of birds. The etymology of “penguin” is controversial. It may come from the Welsh for “white head”, but there’s no real evidence for that conjecture. The great auk had a black head, but white around its eyes. And as the climate “changes” they go to,,,,,,where? Happens every year, or so I am told. One type of penguin is found on the coast of South Africa. Seen one moulting in a cave above the south coast of New Zealand (Papatowai). Any details on that red and black penguin in the lower right? Appears to have molted badly! The northernmost penguins are just north of the Equator in the Galapagos. And while it is quite possible to bathe together with the temperate penguin species as shown in the image, it would usually not be very enjoyable since they are found in cool water areas like the Benguela and Humboldt Currents. Actually MOST penguins do NOT live in Antarctica (only 2 species make Antarctica home). Most live along the coast lines of the southern oceans well above the Antarctic circle in temperate conditions. True as stated above, some actually make it across the equator as the Galapagos penguins will attest. Obviously a hideous beakless mutant they have cast out from their flock. They’ve even put up a fence for good measure. Wow that is a nice penquin Leo…I did’nt know they were red and “I must say” a beautiful copper brown. I would say from a polar bear point of view, they look absolutely delicious. Are they always loners Leo? That red color around their lower part of their bodies must be for mating…whatja think Leo? First off, contrary to what the liberal MSM portrays, the population of polar bears has skyrocketed, from 10,000 in 1970 to over 25,000 now. And now they’re rummaging through urban garbage in their overpopulated state. It’s about time that herd be thinned. And another thing, polar bears, unlike Grizzlies, can’t be effectively trained, to be like actors in movies. It’s not that their brains are smaller per se, but it’s that they seem to be limbiclly wired as meat eating machines and they can’t get beyond seeing humans as food. As crisp taquitos really. Seems so cute, all white like like a baby seal. Hope that cage holds up. The guy inside needs a Smith and Wesson 500 to stick in that bear’s mouth just in case. Are BBC cameramen really expected to have brains? Brokenassbricklayer , OK, your right but let’s get him a brain after he gets away will from that bear. If he has a brain and bear eats him what good is that? I have the same problems opening a can of meat. Elsewhere, Gmail customer enraged as he attempts to open more Spam.. I really appreciate this story about polar bear ‘refugees.’ WUWT has always been a source of real information now it has become a source of comic relief. I just laughed and laughed for a good while after reading about this latest lunacy over at the NYT. What a tragic story about the collapse of a once great newspaper. The NYT just rented out 8 floors of former staff space in its building. Says it all, eh? Actually “blood-thirsty” is a rather unfair epithet. Polar Bears are quite peaceful and unaggressive compared to grizzlies (and I speak from personal experience here). However they do consider humans as convenient prey (being about the same size as seals), so they are quite dangerous when hungry. And wouldn’t you get frustrated if some idiot had locked your dinner into a steel cage? So…what the end of the story. Did she eat him? The video cut out at the good part. Nope. I don’t think so. Despite the cage looking pretty rickety. If the polar bear could have thought to throw a stone. Though I guess the Arctic isn’t really the best place to find stones (perhaps it’s the best place to get stoned, but that’s different [say NO to Sharia law in the Arctic!]). That’s the last thing most prey will see, because it’s awfully dark when you’re sitting in a polar bear’s belly. I live in Tucson, Arizona. Every November I notice a huge influx of Alberta, Wisconsin, and Minnesota climate refugees on the local streets and roads!! WUWT? Are they feasting in your local dumps, lol Climate change kooks are full of endlessly entertaining antics. In Palm Springs they are referred to as “snow-backs”. Maybe we are climate gypsies by nature, Joel. You always meet lots of folks from the colder climes when vacationing in the Caribbean or Riviera Maya. Anthropogenic and opportunistic. Just sayin…. I would too if was them! Hunt seals or get free leftovers? What a pity that so many gullible people will read this nonsense and think it to be true. If you are in any way shape or form familiar with bears, you realise that they will eat the easiest thing around, dead or alive. Any garbage dump in bear country has frequent furry visitors, be they black, brown, Gris, or Polar. Tell us about that. We foolishly formerly had a lidded ‘garbage can’ of corn to feed deer at our north Georgia cabin in the Chatahoochee National forest. A black bear ripped through the porch, unlidded the can, and gobbled up the corn. And did more damage on the way out. Six inch long claw marks half inch deep into Wolmanized deckimg wood. And that is only one of our several black bear encounters the past few years at our georgia cabin. Fortunately, none have ended like EATEN. Of course, these are only docile black bears. Funniest was when Mama bear had three cubs messing with our secured garbage cans. Wifey thought the cubs were so cute she would go take some pics. Opened porch door right onto mama bear snout, as mama was coming onto the porch. Hard to tell whether moma bear or wifey was more surprised. Anyway, all ended well without me having to use my local standby artillery. And you should hear the occasional itinerant wolf pack howl on my Wisconsin diary farm. Much more interesting than the usual coyote yaps. Last year’s deer hunting season was especially wonderful–for my gang of friends and for the wolves. 8 inches of snow, 8 point bucks, and an itinerant wolf pack. Nature is wonderful and grand. Most have no idea. I hear Diarys are difficult to raise. And the milking! Pretty much the same same in Oregon (Murphy outback). Shotgun always ready for defensive action…they’ll be back after ears stop singing! I have at least one bear, here is western PA, who comes on my porch to check over our grill. I set a feeding point about 100 yards out into the woods for them. Looking out my back window I can see a group of maple saplings that a buck has been using to rub his antlers, I have watched him doing it as I sit here, less than 30 feet away, listening to Jim Quinn or Mr Limbow podcasts and working on the computer. Currently in this AM I am watching fat black squirrels chasing each other in the oak tops and waiting for the morning pass through of 2 does and their yearlings. Nature is grand. You are supposedly a farmer, and you keep feed open on your porch? (a trashcan lid only keep out flies and rain and maybe an anemic raccoon). And that seemed like a good idea? Where is your farm (in suburbia? ), and who taught (obviously didn’t) your wife about wildlife? I was raised in Clarion County. Then I-80 went through the middle and it got crowded. Western PA is grand, but the “west” is best. why is there so much wood packing left in the tip? I would think it would be saved and burnt to save money and landfill space? we have plenty of garbage for them. let’s give refuge to these refugees. problem solved. check it off. We have moved into THEIR habitat. They would rather eat large plates of meat, but as long as garbage doesn’t fight back of run away they will eat it. As soon as the garbage supply isn’t enough the bears will go after the next easiest menu item. It’s then that the piper’s bill comes due and all the environmentalists begin clamoring for the removal of these deadly predators. The same was said in Marin county (just north across the bridge from San Francisco) about harmless deer. “OH don’t bother Bambi!” was the chant until deer started coming through the windshields of passenger cars and injuring suburban families. Soon after that the herd began to be managed by selective hunting. Most people have NO IDEA, but is partially our fault for allowing the ignorance to proliferate. Many here on these threads are more interested in observing and understanding nature. It is the environmentalists who think they know enough to play God. FREDERICK, Md. – A Maryland teenager killed a deer inside his house after it knocked over the Christmas tree. It’s the same in New Jersey. You see roadkill all the time, deer mostly . If you’re driving, be sure to have the deer whistles on your car. Black bears are another problem. They are all over the place in North Jersey. There are 2 problems in New Jersey, not enough hunters, and the deer are smart. They know when it’s hunting season and move to areas, your front lawn ( where they fight, mate, eat everything and way too many), where you can’t hunt. $4000 worth of damage to the car. The buck decided the parked car in the driveway was competition. Oh, and then there is the deer ticks that spread Lyme disease. Bambi, indeed ! I’m thinking the polar bears aren’t stupid either. Look at this, those stupid humans just throw food out ! Throw in some of those puffer fish, and you’d have zombie polar bears. And the picture with the little girl hugging the polar bear. I’d like some ketchup as a dip with this snack. As long as I have food in my hand, I have the most loyal dog on the planet. I think some of these environmentalist should experience nature up close and personal. I saw the Amex commercial, where are you brown bear ? He didn’t have to go to Alaska. He could have taken the Holland tunnel out to Wayne,NJ. Most of the limousine liberals only experience “nature” via Disney/Pixar. I can tell, by the idiotic way they hold their tiny tots up within bite-range of my thousand-pound, nearsighted livestock! Really? So, were they “refugees” in the ’20s,’30s,’40s and ’50s? There are photos and stories from whaling, fishing and research stations all the way back to the ’20s about polar bears digging in the trash, hell, pretty sure some are in old National Geographics. No! Bears are smart enough to take the easy way to a feed. This is the same behavior we see among black bears farther south, ya know the bear type that is not a threatened species,? On a mining exploration party in northern British Columbia in 1970, we had a yearling bear that started out in our garbage pit but eventually showed up at the breakfast table (outdoors under a tarp) where he got pancakes and syrup. Babine Lake is a big lake loaded with rainbow trout and we began to catch the bear about a dozen of these in about an hour each evening. Our camp was temporary and after a week, we loaded up our boats with gear and headed up the lake for a new setup on the other side of the lake. The bear ran along the shore to come with us, but we soon left him behind. The lake is huge:177km long and up to 10km across. Google it. The rainbows are several kg in size. Don’t forget, people take the easy way to feed as well. 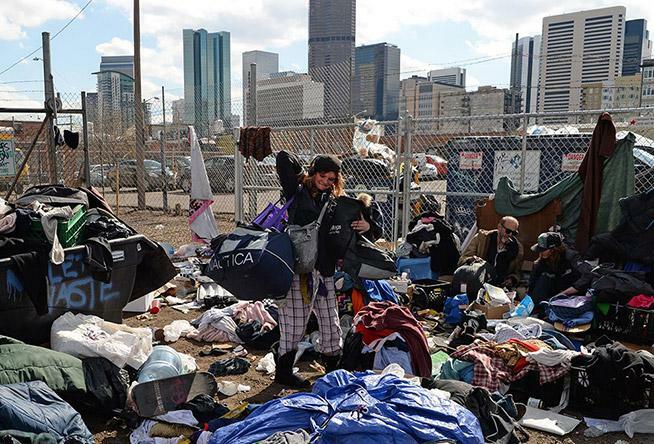 Anytime you want, one can go down to the intersection of Lawrence and Park Ave at ‘feeding time’ for the ‘homeless’ right next to the Denver Rescue Mission. Normally there are not a lot of people around but when it is time for various groups to perform their ministry of enabling people with addictions, a regular mob will show up for the free food. Now there is building right there with a place to sleep and food, but most of these people will not take it. Why? Because you have to stay sober and work. Now why do that when there is free food for the taking every day? Not only will the bears go for the free grub, so will the liberals who wanted Hillary to be POTUS. Whoa! I’ve seen a lot of “rubbish dump” raccoons here in Florida too. I had no idea they only did this when the climate was changing. Down here, the ibis seem to be the rubbish tip dwellers, + feral cats. But we don’t have many big scavengers… except the Greens party, and Malcolm Turnbull. FFS. Churchill Manitoba, also known at the polar bear capital of the world, has had polar bears rooting around in the garbage of that town for decades. My father served in the Canadian air force and was stationed there in WW2. He knew and told me. When the title mentioned Rubbish, I was not surprised the the NYT was involved. NYT – rubbish is correct. Gray lady down. How can a ‘green’ publication justify cutting down trees pulping them making paper, printing on it then distributing the tons of paper? Electronic publishing is far ‘greener’. NY Times—the piper of record. If polar bears foraging at the dump is a sign of ‘climate refugees’ then the rats at the dump are also ‘climate refugees’. Poor rats – climate disruption forces them to forage at the dumps… and the bears eat them!!! Oh, the ursus maritimus injustice!!! Yes, rats originated in South-East Asia so presumably they emigrated from there to get away from the heat during Roman or Medieval Warm Periods or something. And House Sparrows did the same at the end of the Ice-age when they left the Middle East and spread into Europe. A bit harder to explain why rabbits colonized Australia that way, but quite likely BOM can prove that Australia was actually colder than England in the nineteenth century once they have finished adjusting their data. POLAR BEARS! Griff will be here any minute. Anybody who has ever watched bears (brown, black, polar…) scavenge a dump understands bears will take the easy meal if offered. NYT dudes have probably only seen NYC homeless doe this. Yeah where’s Griff the world authority on polar bears , still hiding from that Susan lady probably . HeHeHe……Griff’s still trying to extract his size 11 from his mouth. They don’t like polar bears getting an easy,free meal?? Well then. Why don’t they head out and give them some fresh meat,plus some exercise as the Polies chase them down? Thieving hypocrites. Declining intelligence is one of the tragic complications that those who suffer from climate change obsession frequently exhibit. As the author of this NYT piece demonstrates. unter, it is not only declining intelligence, but, also declining or entirely lacking in real world experiences. As a kid in the mid ’50s at Camp Minocqua , WI , we would have evening station wagon field trips to local dumps to watch the bears . Doesn’t anybody at the NYTimes know that if seals can’t den on the ice, they will have to den on land. Seals are mammals and air breathers. Oh, and if the seals den on land, the bears will catch them on land. Oh, yes, BTW, the Latin name for Polar Bear is Ursus Maritimus (sea-going bears). They can travel considerable distances across open waters. Liberals don’t let inconvenient facts spoil a good hand-wringing, emotionally wrenching narrative (which makes old ladies in trailer parks write checks to their NGO’s). Since when do any bears (hungry or not) avoid open garbage dumps? Seriously – so an animal that is a scavenger (and a predator as well, like most carnivores) is supposed to just walk on by and ignore free food? Even well fed animals will often scavenge if they have the opportunity, because they never know where their next meal will come from. So I guess it must also be an effect of “climate change” when people chum ocean waters and sharks come in to feed….or maybe the sharks, like all predators/scavengers, are opportunistic when it comes to finding food. Good point Shrecken , if bears were fussy eaters not sure how many would be left . Our fat well fed pets love rooting through the garbage, too! Exactly. There is no animal that I know of that isn’t strictly an herbivore (and maybe not even then) that isn’t opportunistic. An easy meal that doesn’t defend itself is preferred to one that will, given a choice. Heartrending indeed. My local warmist fan club in regional Australia has a web site, that includes what they describe as a heartrending photo of a Polar Bear looking up at the people in an ice breaker. I think it needs a thought bubble over it saying ” I wish I could get at those soft centred ones!” they do seem to be a doomsday icon. They are in the dump for the same reason that formerly migratory Canada geese now get fat and crap year-round in California industrial park lakes. Because it’s just a lot easier. Yep, geese are endangered, because they crap all over people’s lawns, driveways, picnic tables, playsets and swings! Even if that was the case wouldn’t polar bears be better off in land? Um…NO. The bright white fur doesn’t camouflage well in the boreal forests, and the navigation through the undergrowth doesn’t suit their large frames particularly well. That being said if they continue to expand their habitats further south they will begin to acquire the abilities to survive in the more boreal south where natural pressures and selection will begin to change their offspring. The would also need to learn to prey on other creatures as well, because I don’t see seals and walruses being able to make the transitions into the forests. But again, and I might think Ms. Crockford could confirm this, polar bears are an off-shoot from brown bears so they would be merely returning to their original habitats. Polar bears eat what they want , carrion , garbage , seals , whale blubber , us , dogs , they are not real fussy which is why they still exist . The NH penguins are not extinct. They were relocated to Antarctica as climate refugees …. I think. Would that justify taxing old people in western countries, where it is already cold even before winter is arrived, old people who need warm homes, and can not always pay the extra cost in taxes and fines for heating , in favor of those polar bears ? Shall old white people have to be declared ” endangered species” for the “greens” to think of them ? Imagine. When Al Gore was born, there were about 7,000 polar bears, and now there are about 26,000. Or so it is claimed. Could the fact checker at the New York Times confirm this? This articule seems to have been written in early December. As far as I know sea off Katovik was already frozen. Yesterday the ice ranged from 0.5 to 1 meter thick. About two weeks ago they had an article about starving polar bears in Hudson Bay. Maybe the next article will discuss starving polar bears in Nome? The thickness of those who study polar sea ice is increasing every year. It’s very hard to bear – particularly in the polar. Fernando Leanme ==> Yes, the Beaufort Sea off of Kaktovik, Alaska has been fully iced over for some time now. The Ny Times article is mostly a false report. Aah, the dreaded “NYT” … save those whales, save those snails. Come January, after that special event in the U. S. A., perhaps the NYT will need to save itself from extinction. I read (always questionable, I admit) that the NYT was renting out whole floors of empty office space in their building – due to the layoffs. I earnestly hope this trend continues. There is a profitable business to made by someone, offering green hunting expeditions to concerned progressive environmentalists, to tour the Arctic and shoot large numbers of polar bears, in order to create the reality suitable for consumption by urban watermelons. “Look – polar bears really are declining, it’s humans fault!”. They could brand it as something like “Elite Hunting”. The climatocracy is an offshoot of kleptocracy more than communism. From the front page of the Ottawa Citizen, just in time to support Trudeau’s carbon tax, a front page story (AKA pack of lies) of climate refugees. There is no need to worry about polar bear refugees. Angela Merkel will give them asylum in Germany. RE “…asylum in Germany.” …Do polar bears eat “Middle Eastern / Eastern European” cuisine, I wonder? I think they will eat whatever they like! If I look at the polar bears in the photos in this post, it seems to me as if they were overweight. Oh wait, there will soon be the next study that overweight polar bears have a shorter life. Mantra: The (human-made) climate change is responsible for everything: for thin polars and also for thick ones. They will all die. For various reasons. It’s all so hopeless. Michelle Confucius Obama. Amen and Ching tai. What s sht tip of a place. Any chance they could tidy up a bit? Here in the UK our landfill sites are swarming with seagulls, I assume that’s because of sea-level rise and not because it’s an easy source of food. Just an additional thought, if the polar bears aren’t eating seals because of climate change are we at risk of climate related seal-level rise? Not only sea level rise, but a whole bunch more seals. Ever seen San Francisco’s Pier 39 marina when the seals take it over? Seal poop & warm sun – bad combination. The polar bears are actually confronted with three conflicts. 1) They must adapt to climate change. 2) As predators, they represent a competition for humans. 3) They are dangerous to humans. 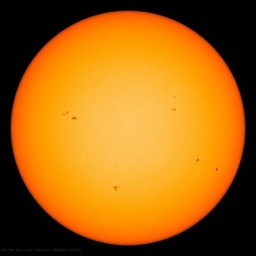 Does the current situation really already have something to do with global warming? Or does it have something to do with the global human’s spread? Would anyone have written such an article if there were no people in Alaska? In some decades food will become scarce worldwide. People will increasingly hunt predators so that they won’t be able to kill those animals we will need as food. This also applies to the polar bears. Unless global warming will kill them, we will do that. It is a shame how we harm this world. According to the global ecological humanity’s footprint, we already need more than 1 Earth. The human overpopulation is mainly responsible for this situation. Due to the damage already done, geologists have already proclaimed a new earth age: the Anthropocene. I think we should try to reduce the human world population to 3 or 4 billions. Then Earth could certainly reestablish a natural balance. A lot of problems would be solved that are caused by overpopulation. I am ready to help. Start by not having a family. Fund raising might go better if they cut their phoney-baloney numbers in half and tell everyone we need more than 2 Earths. Alarmism works better when it’s more alarming, you know. Well entrance, if you’re really ready to help, you might consider an exit. I know, one-three-hundred-billionth of the solution seems woefully small but it is a start and it might become a trend among others with similar convictions. You are a member of a developed, industrialized civilization so you impose a much greater burden on the earth’s resources than a Kalahari bushman for example. Therefore your exit would remove a much larger portion of humanity’s muddy footprint than the demise of some poor Third World goatherd. Perhaps the most ethical exit would be to swim out into the ocean or other large body of water on a course perpendicular to the shoreline. You would of course undress before doing that in order to keep from introducing synthetic materials into the food chain. This one-last-skinny-dip would make the least demand on resources because you would be using earth’s most abundant compound, water, instead of refined, manufactured material such as rope, metal or drugs. It would prevent any expenditure of precious resources such as the transportation of your remains to a place where inquiry into your demise could be conducted. In fact you would be contributing to the ecosystem by providing nutrients to a variety of organisms. Give it some thought. “we” means you and who else? Do you have names? Otherwise, how is Gaia going to produce plastic without us? plastic? Give George Carlin a hat-tip. Not a problem! Razor blades are plentiful and cheap, so go ahead and do your part for Mother Gaia. entrance, thanks for the thought-free echoing of the biggest fool posing as a scientist of our age, Paul Ehrlich. Do you have any idea as to just how ignorant it is, as world food supply increases (in significant part due to increased CO2), to assert that we already need more than one Earth? And do note that the claim we are in an extinction crisis is what is now called “fake news”. I’m a geologist and i don’t recognize the Anthropocene as a new earth age. Maybe SOME geologists have, and I may be a survey of one, but it refutes your assertion about geologists. Nor do I but it is talked about. There is need for a “golden spike” – a global marker in the environment that should be visible years – even millions of years – into the future for scientists to see. This would allow them to identify the start of the Anthropocene. There isn’t anything like that so there isn’t an Anthropocene. Waiting for a big big asteroid. Go on then, you first. Show us how to go about it. Well there’s your first indication of the innumeracy of these morosophs (well educated fools). The earth cannot support the load that it is currently supporting…all evidence to the contrary. I suppose then we and every other creature on the planet must be imaginary. Or….maybe that is just an incredibly stupid statement. 1) People have been in Alaska for 11,000 years; NYT has existed for 165 years. Proof is left to the reader, but probably fewer polar bear articles before 165 years ago. 2) Don’t even know what to say about “we already need more than 1 earth” – maybe you should go find it. Send us a postcard when you do. Please leave now. 3) If you think it’s a shame how [humans] harm the world, you’d be real upset at ice ages. 4) Speaking of ice ages, polar bears have survived thru a number of them (including the global warming part) – been there & done that. Probably could have done better if guys like you were there to help them. 4) “…we should try to reduce the human world population to 3 or 4 billions… I am ready to help…” go ahead, jump! Good lord. In all seriousness, get a grip you tender snowflake. Perhaps they don’t know it’s a garbage dump? Has anyone from the EPA explained to the bears that you are not supposed to eat the food here? If the EPA put up a sign to that effect, then the bears would know better. That is an excellent idea! Are you by any chance a planner of some sort? Next, they’ll ban dumping garbage in the garbage dumps because it’s a wildlife preserve. Then the bears will starve. No they won’t starve. They will do just like the bears of Yellowstone did when the tourist were told to stop feeding them. They ate the tourist. Oh, that triggered a memory for me. The more people catch on to the fraud of AGW, the more ludicrous the claims for it become. The article also quoted tourists bemoaning how dirty the poor bears got scavenging in whale carcasses, with the comment that there is always Photoshop to clean them up. Even with PhotoShop, how do you clean up a whale carcass? Trackhoe. Bulldozer. Dirt. Whale all cleaned up! The New York Times science articles about global warming have been unbelievably shallow. This article provides zero proof and a misleading claim about “receding ice.” This what total speculation in the absence of knowledge looks like. Despite this AGW article being completely devoid of facts and reality (which is normal for such an article), it’s clear that the article was written as clickbait so WUWT would carry it and get enough clicks to stay in business for another week. Also be advised and alarmed that reindeer are shrinking. Tree planting up in BC many, many moons ago. Foreman told me to come out of my tent real slow and stand up tall. Seems a brown bear was poking around not far off. Great I thought and grabbed my camera (with film, remember those?). Real wildlife to tell the (then highly unlikely) grandkids about. So I step out and stand tall but the brown bear stands taller even though every single hair on my head stood up. Primal instinct I guess. Never did get that photo but I will forever remember that bear. We need him to weight in with his expansive polar bear expertise. Griff may inadvertently have fatally damaged himself with the polar bear stuff; kinda like walking into a spinning propeller. He may need to be reincarnated as a different sock-puppet (though he does have a unique style that may shine through…). Even pet-trolls may lose viability if the number of arrows shot into them weighs more than the troll. Also make it difficult to crawl back under your rock. Oh Lord. I grew up in Alaska. Not in polar bear country, but in Anchorage. Was it climate change that brought all the moose into town during the winter or could it possibly have been that moose were smart enough to recognize that life in town was a lot easier. They didn’t have to worry about wolves, or hunters with rifles. They didn’t have to contend with deep snow as they searched for forage. There was lots of garden leftovers and their normal fodder was in abundance in the undeveloped lots and parks. I probably saw a couple moose a week in just my neighborhood. Animals are a lot smarter than the libs who idolize them. If they have found a way to scavenge from humans, they’ll exploit it and in most cases, benefit. Don’t ALL bears raid garbage dumps. Has this not been happening for over a century. Of course the bears are in trouble… sea ice retreat along the Alaskan coast has been early and severe in recent years. Griff, if your resistance to facts and critical thinking could be weaponized you would change the world’s military balance. Of course, more polar bears and better housekeeping (better trash disposal, less “free food”) means skinnier bears. However, Hudson Bay has NOT gotten any larger between 1984 and 2015-2016! The maximum AND minimum sea ice in Hudson Bay has remained IDENTICAL since the last Ice Age gouged out Hudson Bay’s near-circular features in the granite! Maximum sea ice over Hudson Bay = 1.2 MKm^2 – same as today. Minimum sea ice = 0.00 MKm^2 = Same as today. Looking at the Cryosphere’s daily sea ice records for Hudson Bay show NO trend in the melt season (more than a few days) – which is not enough to NOT affect the seals and wildlife around the entire bay – compared to the wildly varying season to season changes. (If year-to-year cyclical changes from 1.2 million square kilometers to 0.0 sea ice vary by 12-14 days every year, then a 40 year change of 2-3 days in the length of that cycle means nothing. EVERY polar bear who “knew” of a 200 day-long ice season has died, and EVERY polar bear that experienced a 220 day ice season has died, and EVERY polar bear who experienced a 180 ice season has died, and every polar bear who has experienced anything between a 180-200-220 day ice season has died. Still lying about polar bears, Grifter? Have you apologised to Dr. Crockford yet, you obnoxious, smearing, mendacious little propagandist? You have some damn gall showing yourself on here after the way you’ve behaved. There was a paper … indicating that polar bears became a distinct species about 600kya (+/- 300k years). This means that they have survived at least two (and possibly eight) previous interglacials, in particular the Eemian (130kya to 110kya), when temperatures in the Arctic were 5 to 8 degrees Celsius warmer than current temperatures for several thousand years. 2) The carbon brief talks about the IUCN/PBSG estimates. That group now includes a footnotes in their reports that says these aren’t valid scientific estimates — “As part of past status reports, the PBSG has traditionally estimated a range for the total number of polar bears in the circumpolar Arctic. Since 2005, this range has been 20-25,000. It is important to realize that this range never has been an estimate of total abundance in a scientific sense, but simply a qualified guess given to satisfy public demand. It is also important to note that even though we have scientifically valid estimates for a majority of the subpopulations, some are dated. Furthermore, there are no abundance estimates for the Arctic Basin, East Greenland, and the Russian subpopulations. Consequently, there is either no, or only rudimentary, knowledge to support guesses about the possible abundance of polar bears in approximately half the areas they occupy. Thus, the range given for total global population should be viewed with great caution as it cannot be used to assess population trend over the long term.” — Dr. Dag Vongraven, chairman of the IUCN Polar Bear Specialist Group (PBSG). Here is the current Canadian Department of the Environment estimate on polar bear populations around the world – https://www.ec.gc.ca/nature/F77294A3-FC08-4EFD-A330-DB2380C1AEE4/map4_en.jpg — You should notice a huge shift from 2009 to 2014. In 2009, seven populations were listed in “decline”, in 2014, none are (although, two are listed as “likely decline”. In 2009, the Western Hudson Bay was in likely decline, now it is “likely stable”. Oh, look! The lie spewer hath arrived! With all the alleged lack of cubs, how do you explain the population increase? Looks to me like they’re smart polar bears. Garbage dumps are so much easier than chasing down seals. Climate has nothing to do with it. Of course the NYT will ignore illegal dumps and out of compliance landfills when it suits them. Has nothing to do with climate but it is a different type of tragedy. Garbage addicted bears are dead bears walking. Meanwhile, here in California, now that the “Waste Zero” meme has caught on, and led to multi bin garbage and recycling trucks with robotic arms, naturally it has also led to easy opening cans. Bears, not to mention raccoons, coyotes and mountain lions, adore them. I have said this before. I used to hunt moose at the arctic circle in early ’90’s. I spoke with a man natural resources who said they used to drug the bears in town in northern Manitoba and haul them out of town. By the look of the photos, the well fed Polar Bear take-away operatives are a whole lot smarter than the Climate Alarmists commenting on them. The seals are happier too. Eric ==> The bears are there because the natives hunt whales and leave the stripped carcasses out for the bears to clean up — every year — year after year. Bears, like all other animals, have an extremely good memory for where food might be found and return to spots where they found food before, even years later. If the bears didn’t show up, or came in skinny and malnourished, that would be a worry — hungry bears can be very very dangerous. Hmmm….I don’t suppose to these CAGW geniuses that the concept of “the survival of the fittest” might have room for those who have have found where “the eating is the easiest”? Or, maybe, this is yet another case where anything Man does is unnatural, in this case a garbage dump, because …. what? …. Man is not “natural”? Man is not a part of Ma’ Gaia’s plan? Just what is the axiom of their logic? It’s amazing they don’t know that polar bears would eat anything. Seal pups are only on the menu because there is nothing else available out there. Less ice actually increases their food supply! It would just be dumb to wait hours by an ice-hole when human garbage is so handy. These eco-loons seem to get degrees without actually reading books. And why does nobody weep for the poor seal pups? Are they only cute when humans kill them? Somehow the eggheads of society have determined that mankind is separate from nature and everything we do upsets its ‘balance’. If we desire to bolster the Polar bear population, the dumps as feeding stations are a symbiosis, at least from an intrinsic perspective. All that is needed is proper administrating and locating of the feeding sites. Surely those who fear extinction of this lovable predator beast could fund that effort, aay? This is just like the crop circles in Britain years ago. They would regularly occur on a Thursday night and get reported on the Friday news. Tourists would go out over the weekend to see them. The farmers would just have! to charge the tourists for walking all over their crop. The tourists would just have! to go and see each set of circles to carefully compare measurements down to the centimeter. This is a beautiful study in economics. A market will always appear no matter how strange the environment. I’m still stumped to see who is taking advantage of whom; the bears?, the Alaskans?, the environmentalists? I do however think the NYT reader is last one standing when the music stops. Utter bovine excrement. Desperation bordering on the comical. “The ice is getting thinner; it’s melting earlier and it’s coming later. New studies suggest that polar bears can only survive for about 180 days on shore. Hahahahahahahahahahahahahaha!!!!!!! You need to take that comedy routine on the circuit, griffie, you are just too funny. “Polar bears in the beleaguered southern Beaufort Sea population are now three times as likely to come ashore in summer and fall as they were in the mid-1980s, according to the study, by scientists from the U.S. Geological Survey, the U.S. Fish and Wildlife Service and two universities. The bears that come ashore are also staying there much longer than bears did in the past, according to the study. Stop, stop, stop! I can’t catch my breath. Oh ho, so funny, bears can’t survive where they have ready access to food and shelter for their cubs! BWAHAHAHAHAHAHA!!!! Yes, but is PLOS ONE qualified to publish that article? How do we know this isn’t just one of your troll comic books? there’s a lot of polar bears happy lucky feeding on people’s behalf. Polar bears are very protective of their food sources, seems these three or four are having a great time. Occam’s Razor – animals are not stupid, they will get food the quickest and easiest way they can. Why hunt for food when there is a pile of it just waiting to be scarfed down? That’s WHY foxes go into bins and seagulls pinch your chips… it’s easier than dive bombing fish or chasing forest meeces – same thing here with the PBs. I do wish these religious believers would stop trying to piggy back everything to their fantasy! I have never seen a fox dump on my shoulder, but I get your point. WOW! Griff is still on the bile trail. How about making a donation in the other thread?